State emergency officials, after reporting that at least eight people died in last week’s floods in Colorado, revised the death toll to six. The reports of the number of missing people have also been contradictory and confusing, with various state and local agencies giving out conflicting numbers. State officials listed 1,253 people missing on September 16, and later that same day revised it downward to 658. The weather began to clear on the afternoon of September 16, allowing helicopters to airdrop supplies and airlift out people who need help. Door-to-door searches for missing persons began the same day. Most of the missing are in Larimer and Boulder counties. Many live in remote mountain villages that are difficult to reach in the best of conditions. The Federal Emergency Management Agency (FEMA) dispatched two search-and-rescue teams to help with rescues in Larimer County and other nearby communities. The Denver Post reported that 110 people had been evacuated from Larimer County, and between 300 and 400 more were expected to be taken to Fort Collins. Residents were asked to use white sheets, mirrors, flares or signal fires to help attract the attention of the aerial search crews. They were also advised to have their important medications, clothing, and other items ready to go when help arrived. Boulder County assigned 10 police officers to search for missing people. Police and other agencies are being inundated with phone calls asking for help locating relatives, immediate family members and friends. In Lyons, described in one news report as a “funky mountain town,” telephone landlines were knocked out by the flood and most people’s cell phone batteries had been dead for some time. One man and his young son were seen driving around Lyons looking for someone from FEMA so they could let their family know they were all right, but the only official they saw was a local emergency worker who was advising residents that it was their last chance to evacuate. People living in mobile homes are always at high risk in severe weather events, and this one was no exception. 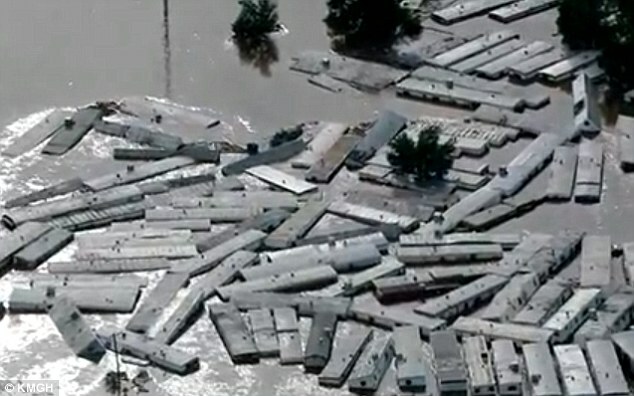 Most of the trailer parks in Lyons were completely destroyed. In the town of Milliken, in Weld County, 150 people living in two trailer parks were displaced, and some 45 trailers were red-tagged by the city, meaning they were beyond repair. The owner of Evergreen Mobile homes, Tim Solomon, said he doesn’t have flood insurance because the park is outside the historic floodplain. He thinks 32 of the 35 trailer homes in the park were destroyed. This photograph makes plain the vulnerability of mobile homes to heavy flooding. This one shows how they can be swept along like matchsticks before an advancing wall of water. In Evans, it was reported that about 260 homes and mobile homes near the South Platte River and 37th Street were covered with mud. People had to walk in to try to recover what personal belongings they could. Once evacuations are finished, the search for the missing and dead will begin in earnest. With many impediments (major roads have been washed out or covered by boulders and mud, some hamlets like Glen Haven have been reduced to rubble, and gas pipelines and sewer systems have been destroyed), the search for the dead could take weeks or even months. Frank Lancaster, the town administrator of Estes Park, next to Rocky Mountain National Park, said that the town could be unreachable and uninhabitable for up to a year. As Colorado tries to cope with the aftermath of the flooding, high waters are rushing down the South Platte River toward Nebraska, causing worry among residents there about potential overflows. The flooding has led to widespread concerns over environmental pollution. Sewer overflows have been widespread. Oil, natural gas condensates, or both have been spotted in the rivers and leaking from storage tanks, and there is worry over the possibility that drilling and fracking fluids might have escaped into the floodwaters. For a week, anti-fracking activists have been complaining that the media were ignoring this part of the story, but a major oil spill has now refocused attention to the risks of these operations. The Denver Post reports that at least 5,250 gallons of crude oil escaped from a damaged storage tank owned by Anadarko Petroleum and flowed into the South Platte River. Oil industry crews have been putting absorbent oil booms in the river since Anadarko reported the spill to the Colorado Department of Natural Resources on Wednesday afternoon. The spill occurred south of Milliken where the St. Vrain River flows into the South Platte. Fertilizers and pesticides washed off of vast agricultural lands of Eastern Colorado have been an ongoing threat to the environment. Concern is growing that the lands themselves may become contaminated with drilling and fracking fluids. The South Platte River is fed by drainage from much of the eastern flank of the Rocky Mountains in Colorado, much of the populated region known as the Colorado Front Range and Eastern Plains, and a part of southeastern Wyoming. All of these are active oil- and gas-producing regions. The South Platte joins the North Platte River, forming the Platte River in western Nebraska. It eventually flows into the Missouri River, the Mississippi River, and ultimately the Gulf of Mexico. While much of the entire Mississippi Basin is agricultural land, and the threat of fertilizer and pesticide contamination is not new, the possibility that drilling and fracking fluids, witches’ brews of toxic chemicals, might contaminate vast expanses of farmland is a more recent matter of concern.